It was a week of non-stop "ticket" requests. Facebook, Twitter, BBM, SMS, name it! 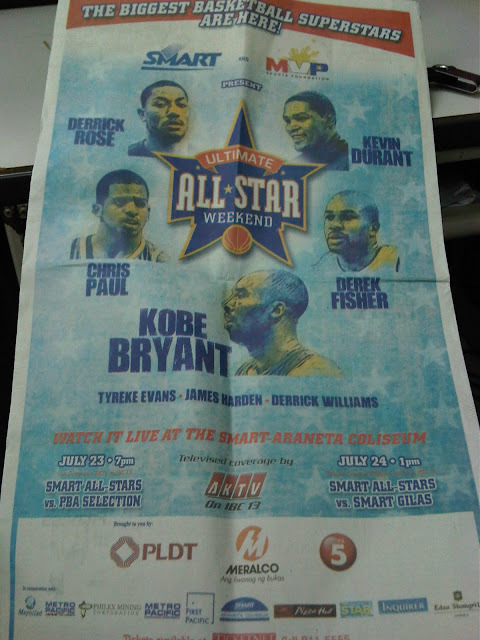 I really felt like I was Ticketnet after getting flooded with messages requesting for tickets for the Smart Ultimate All-Star Weekend. It's probably the first time that famous NBA players came to the Philippines to play basketball against our local basketball players; so nobody seemed to let this chance pass. Thank God we're part of the group which brought them here -- the MVP Group of Companies. Smart and MVP Sports Foundation together with TV5, played a big role in this once in a lifetime event. The night of July 22, we were at the Big Dome to fix some stuff for the big weekend. And we were surprised that at 10pm, the doors of the coliseum were being shut and security was alerted. Then woah! Some of players came in to do some practice shooting. Chris Paul and James Harden came in first with their entourage, but they were kinda snob. The 2nd batch who came were Tyreke Evans and Derrick Williams. I said "hi" to both and them and they smiled at me and said "hello". Cool! We followed them in the court but we were driven away by the very strict bouncers (yeah even if we're kinda part of the organizers). A Meet & Greet lunch at The Lighthouse in Meralco was organized to accommodate fans who can pay at least Php10,000 for a lunch with the NBA Stars. Then a Basketball Clinic was held at the Ynares Gym, wherein the NBA players taught the basics to young boys. The event's Press Conference was held in the Isla Ballroom of EDSA Shangri-la Hotel. The hotel security was very strict; some members of the PRESS were not even able to enter the hotel. First to answer the questions from the media were PBA Players Sol Mercado and Gabe Norwood, and the Philippine team's Head Coach, Rajko Toroman. The NBA players came in one by one, and were never complete in the presidential table. After answering questions from media, they went up to their rooms to rest and prepare for their game in the evening. At 7:30pm, the show started. 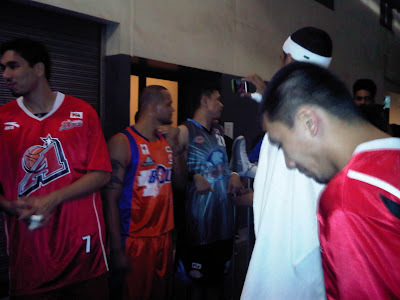 I was in the dugout with the PBA players who were so excited to play against the NBA stars, but were actually more excited to get autographs from and have photos taken with their NBA idols. Security was soo strict that we can't take photos of the players. I was lucky that I got an inch closer to Kobe, but he wasn't able to hear me calling him to look back, so I just took a snapshot of his back. haha! I didn't have a seat but I enjoyed watching the game even if I was standing on the first half, then at the second half, I found seats beside my Smart Gilas friends. I took a couple of photos and videos during the game. It was obvious that the PBA All Stars got starstruck with their NBA idols. They just played the game for fun, and it's been a dunkfest for the NBA stars. The crowd really enjoyed the fact that it has been an awesome "show". 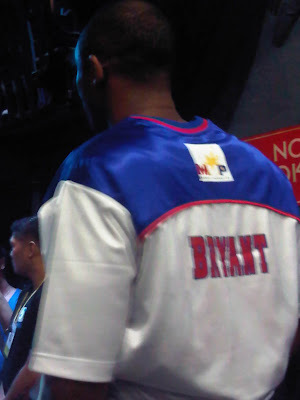 Team Philippines really put up a good fight; while Manny Pacquiao's arrival became a show stopper. The NBA stars asked for autographs on their jerseys from him. The score gap wasn't as big as the previous day's, and that proved how talented our local basketball players were, most especially Japhet Aguilar who had a coupe of dunks, and Jayvee Casio who had a couple of 3-point shots. Great game! Kobe Bryant and Manny Pacquiao! Also, after the show, a mini presscon was held at the center of the court. The best part, the NBA stars threw/gave away their belongings such as jerseys, shirts, and shoes! The players left right after the presscon; while Derrick Williams and James Harden went for a quick shopping in Greenhills with their security team.